Home INTERIOR DECORATION How To Choose The Right Baby Crib For Your Baby Room? 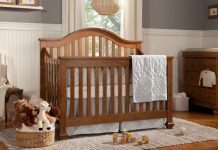 How To Choose The Right Baby Crib For Your Baby Room? A baby’s room is really a tranquil place where the things in the room appear so soft, pleasant and peaceful. Decorating child’s room is very crucial and needs special care in choosing the wall colors, ventilation, and other factors. Choosing the right furniture for the baby room is an essential part of baby room decoration. It needs to be colorful, beautiful and functional for both baby and parent. You have a wide-range of varieties when it comes to the selection of furniture to your baby room. Prior to furniture selection, consider the purpose of buying the furniture for your baby room. How long you employ the furniture unit? Do you prefer furniture pieces according to the trend? Prefer using the furniture for another baby? When purchasing a baby crib, ensure that the surface of the crib is even and damage-free. Prefer a baby crib with high railings and a locking system to lock the crib whenever you leave the baby in the crib. The baby crib is perhaps the first and the most essential furniture unit that reflects in the mind when you consider the baby room furniture. It is a place where the baby spends more time during the early stages of life. So, a baby crib should be comfort and safe. This is because you leave the baby alone in the crib when the baby sleeps [Beautiful baby crib sets]. The baby crib comes in wide varieties where you can choose from. You can have crib models that can be transformed in stages, starting from a crib to tot bed and to a full sized normal bed. The baby crib mostly come in two styles: Single drop side and double drop side. The former have one of the sides fixed and the other dropped down, whereas the latter have both sides dropped down. You can choose a baby crib based on the size and the gender of the baby. Standard, round, iron, canopy crib, designer crib, portable, hand-painted and convertible cribs are the most widely available baby crib types. A standard crib is usually the most common and economical than other crib types. Convertible cribs are also very common but comes only in a few styles. The iron crib has been under use from a long period and very economical. Round cribs are gaining popularity in recent years and looks great but the bedding choices are very few than a normal shaped crib. Portable cribs looks great but have limited bedding options. Designer and hand painted cribs are also gaining popularity recently but are more expensive than any other baby room furniture. While using crib mattresses, make sure that you leave no gaps between the mattress and the crib sides. Carefully wash the crib bedding. Wash the light colors and dark colors separately. Wash polyesters using warm water and cotton using hot water. Use only mild detergents. Before washing the baby crib bedding check the label and carefully follow the instructions. Once washed, allow the pillow to sun dry and turn the pillow frequently to dry thoroughly. Clean the railings of the crib with a cloth and use vacuum cleaner to make the crib dust-free. Previous articleBackyard Ponds: Another Private World For You At Your Back Door! Next articleDesign Your Bathroom Perfectly With Right Bathroom Tiles! Make Your Baby’s Bed Safe and Cuddly!